For regular readers of my blog, you may have noticed the half sleeve tattoo I have on my right arm. But, chances are unless you happen to have met me you probably have never seen the inside part of the Legend themed work. 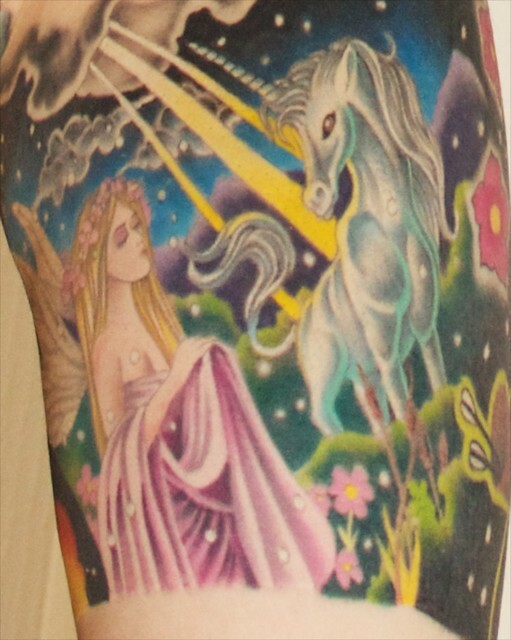 The dominant part and most visible part of the tattoo is the gorgeous portrait of Darkness and Gump, the inner arm is a delicate and feminine scene of the faery and unicorn in this cherry blossom and snow covered field. The artist, Shane Faulkner, did a wonderful job with my direction of “I want a Legend themed half sleeve with the faery, unicorn and Darkness. And as many other characters I can fit”. This is just one portion of what he created on my skin and the whole tattoo is beautiful. I adore my tattoo. It makes me feel proud, strong and yet also very feminine with my secret fantasy scene.